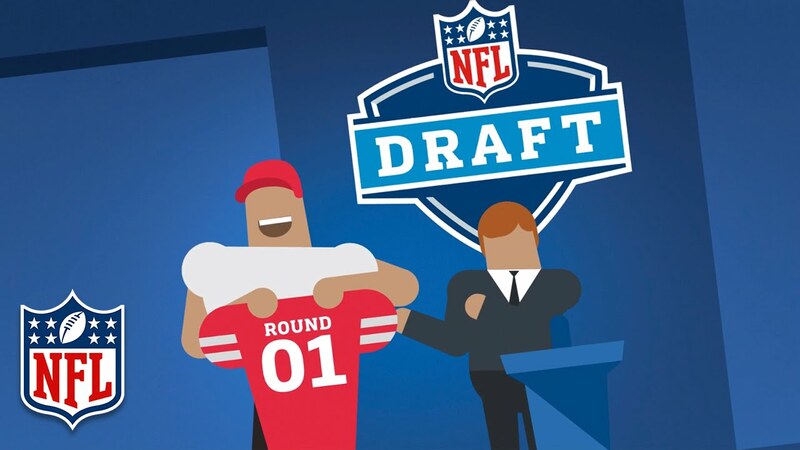 NFL Draft Process: After the Pro Day -What is next? 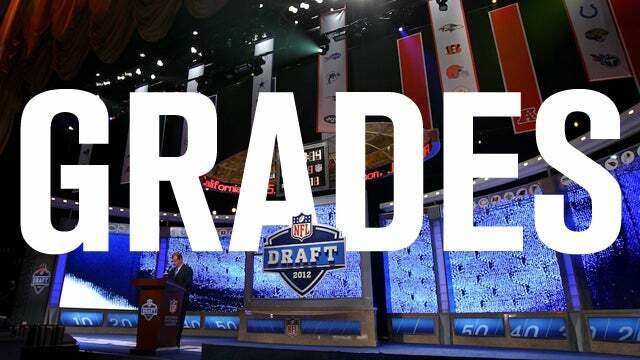 After the Pro Day what is next for the NFL Draft Prospect? 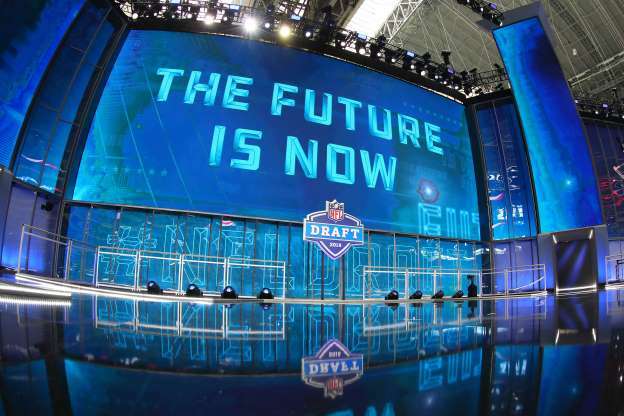 Author Justin VanFulpenPosted on March 19, 2019 March 19, 2019 Categories NFL DraftTags College Football, Justin VanFulpen, NFL, NFL Draft, Pro Day, SportsLeave a comment on NFL Draft Process: After the Pro Day -What is next? BLETSO and National have their spring meeting to go over grades around Labor Day time in May to be able to help set the scouts schedule for training camps visits in the summer. Prospects are not told what their spring grade is by the two scouting services, but normally in the summer the grades get out and agents, financial advisors, media members and all-star games get their hands on them. Height/Weight/Speed – The scouts either get that information when on campus when the measure and weigh the prospect as well as get hand size and arm length. Some school will allow the prospects to run the 40 for the scouts but that is very few and mainly smaller schools. Some schools don’t allow scouts to do height/weight so the scout will just have to estimate the prospect height/weight/40 time. Background – Scouts will try to get information on prospect past both off the field and medical. All-Games: Even before an agent signing a prospect he/she is most likely contacting the director of the all-star games but especially after a client has signed with an agent are they contacting the directors to see if they can get their client in a game. With the All-Star games being the last time football is practice or played it is the last time the NFL scouts will have a chance to evaluate the prospect in person, and as we always see players rise and sliding because of all-star game practice and game performances. Film: Agents should be contacting scouts and coaches to sell and promote their clients best game film against their best level of competition that they played. 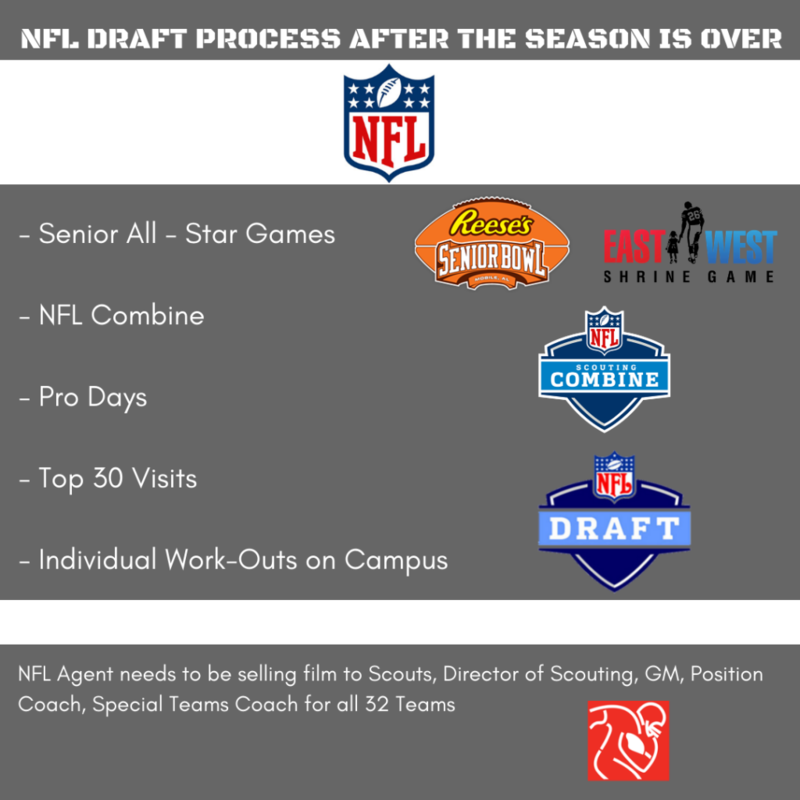 With the game films agents can sell to scouts and coaches how their prospect fits into the team’s schemes and how they would be an upgrade to their roster. NFL Scouts: Scouts make their own judgement and are paid to give their opinion on a prospects ability to play in the NFL. Agents are contacting scouts to give them information about their prospect and sell their prospects ability to play football. Promotion of Prospect: An agent is looking to use the media as a form of getting their prospects story out there also to make sure other teams know that there is more than just one team interested in the prospect. Also an agent is looking to see what deals that they can make in with different companies to make their prospect additional money off the field. Some agent or agency might outsource these two jobs. Also each prospects ability to make money off the field will be different based on how high they are projected to be drafted as well as what position that they play. Knowledge of the NFL Landscape: Each prospect is in competition with every player in their position as well as the current players at their position in the NFL, so an agent needs to have a working knowledge base to properly advise their client. They need to know what they of offense and defense scheme a team runs. It would be embarrassing if an agent was promoting a 3-4 defense end (5 tech) to a team that runs a 4-3 defense. Also if a prospect is not drafted where he is advising his client to sign is a big deal as if this prospect is just a “camp body” or has an actually shot at making the 53-man roster. What is the agent using to make a determination, what they are offer as a signing bonus or what the team currently has on their roster at their client position and the scheme the team runs? So knowledge of the NFL is an important thing. These are just some of the tasks that an agent performs per draft there are many additional ones after the draft is over. Athletic Numbers (10%) – Height, Weight, Speed. Teams are looking at the film first and then see if the prospect checks off the box in the athletic numbers per the position. But still the film comes first. 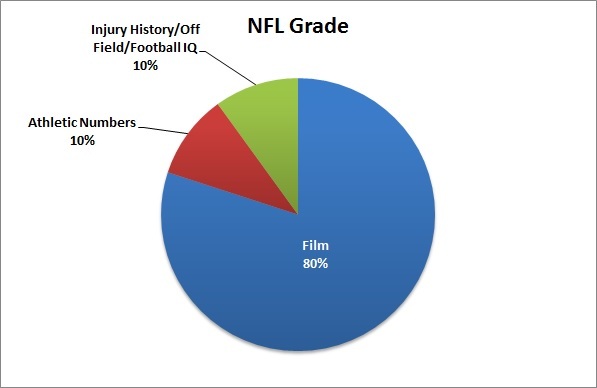 Injury History/Off Field/Football IQ (10%) – Any major injuries, anything major off the field, love of the game, film study. 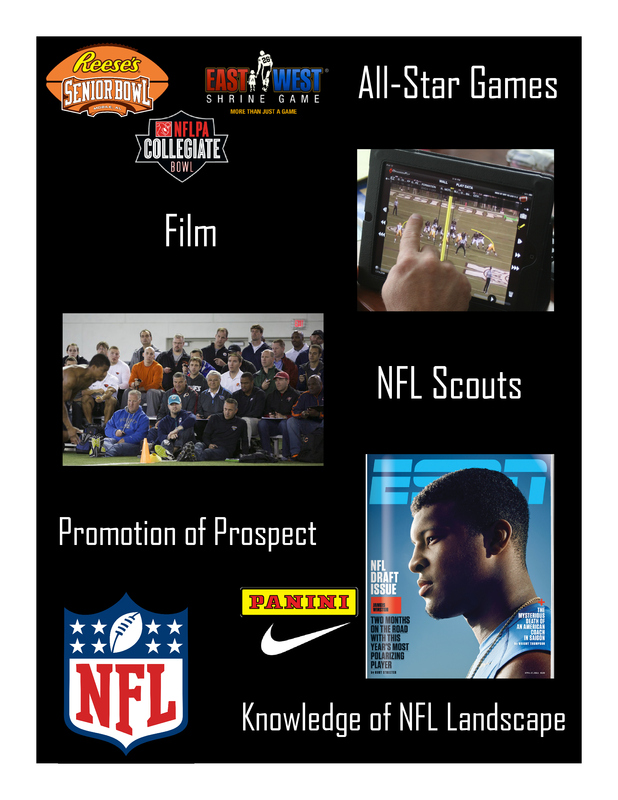 Scouts are check social media, talking to high school coaches, strength coaches, academic advisors, current coaches as they try to find out as much information on the prospect on and off the field. Teams will reject players fully for injury and off the field issues no matter how good a player is on the field. Domestic Violence/ Violence against Women – There are many documented cases that has affected guys draft status including two years ago with running back Joe Mixon (Cincinnati Bengals). Even with this happening a few years ago many teams took him off their draft board and he dropped a lot further in the draft then many people had him graded on film.